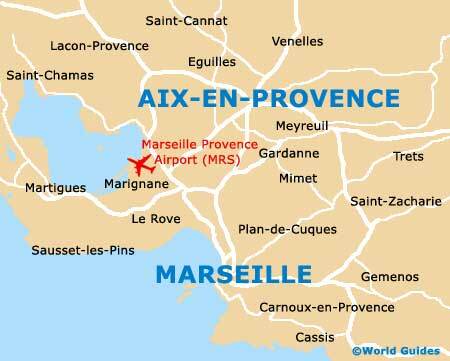 Marseille is the second-biggest city in France and is known for its stunning Mediterranean coastline and major harbour. Second-only to Paris in so many aspects, Marseille is amongst France's most historic, attractive and popular cities, being full of character and terracotta roofs. However, Marseille has one big difference, it is home to a number of gorgeous sun-drenched sandy beaches, lined with corniches and plenty of coastal attractions. Within the city are plenty of charming districts, where busy bazaars and street markets await, particularly around the old port, which is a great place to explore and offers plenty of pleasure boats. The Marseille tourist information centre (Office du Tourisme et des Congrès) is located in this part of the city, being sited at the end of the city's Canebière thoroughfare. This information outlet provides plenty of top tourism advice and useful maps of the main districts, including Le Paniere and the Vieux Port. For more tourism advice, an additional tourist information centre can be found at Marseille's Gare St. Charles train station. Tourists visiting Marseille will be overwhelmed by the historical attractions on offer. Highlights include the Basilique Notre Dame de La Garde - a must-see sight located on the southern side of the Vieux Port; Château d'If - famous for its appearance in highly acclaimed novel The Count of Monte Cristo'; Centre de la Vieille Charité - a large exhibition centre sited within Marseille's Panier district and dating back to the 17th century; La Cathedrale de la Nouvelle Major - a particularly beautiful cathedral built at an enormous cost and overlooking the sea; and the Palais du Pharo - a grand palace, once the waterfront residence of Napoleon III and now home to many seasonal exhibitions. 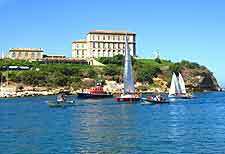 Other top sights and appealing tourist attractions around Marseille include its numerous parks and gardens, of which the Parc Borély, the Jardin du Pharo and the Jardin Pierre Puget stand out. Also worth a visit are the ancient fortresses of St. Jean and St. Nicholas, the city's Abbaye St. Victor church, and the neighbouring islands of Pomègues and Ratonneau. 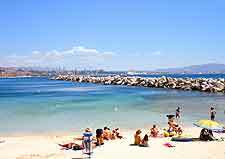 More information about Marseille Tourist Attractions and Marseille Landmarks. For tourists and museum lovers staying in Marseille, a number of excellent options present themselves. The best museums and art galleries in Marseille include the Musée d'Archéologie Méditerranéenne - with a range of local artefacts and even some Egyptian treasures; Musée d'Histoire Naturelle - a popular natural historic museum with many hands-on exhibits and information about the natural world; Musée de la Mode - a interesting look at the famous world of French fashion; Musée du Vieux Marseille - full of local history and information about the city's past; Musée Cantini - overflowing with modern art works and paintings by famous artists; and Marseille's Musée des Beaux-Arts - a particularly historic museum with a number of sculptures created by local sculptor Puget. 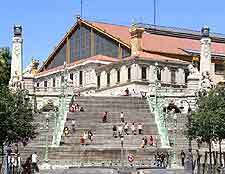 More information about Marseille Museums and Marseille Art Galleries. 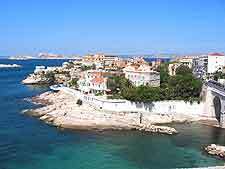 Close to Marseille are a large number of inviting cities, towns and villages, many of which make perfect day trips and contain more than their fair share of tourist appeal. Of particularly interest, the city of Aix-en-Provence is known for its spacious public squares and grand mansions, while the fishing village of Cassis offers a breathtaking coastline and a number of secluded beaches. Also close to Marseille and worth a look is the port of La Ciotat, the charming town of Aubagne, and the Medieval market town of Arles, which boasts a particularly impressive Roman arena. More information about Marseille Attractions Nearby.